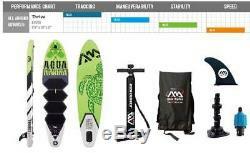 HAS EVERYTHING YOU NEED TO GET ON THE WATER! From the success of its sister Breeze, the Thrive takes its inspiration from the most popular nautical animal - the Sea Turtle, and is presented in stark white, black and green. In keeping the signature color of the Breeze and feel sure to please the professional paddlers' eye. With its generous volume, and an integrated kick pad, the Thrive is ideal for those lighter riders on flat water and for those that want to enter the waves. Ideal for riders up to 198lbs/90kg. Utilizing premium Drop Stitch core material technology, ensures super lightweight, durability and stiffness. Double rail construction with 1000 Denier extra rail band reinforcement. SuperTough Dual Stringer(STDS) technology. 1000 Denier center stringer for additional stiffness and rigidity. Full deck and base quality graphic printing and raildesign for superior optics. Highly efficient shape for cursing and exploring. Action camera Mount Kit include mount base and extend boom. Fins: Easy slide-in and removable center fin Stainless steel leash-ring on the deck at the tail. Integrated cargo D-ring with elastic straps. Tail kick pad for critical bottom turns and cutbacks. Board Size: 99 x 30 x 6. Max Payload: 265 lbs / 120 kg. Net Weight: 18.1lbs / 8.2 kg. What's In the Box. JOMBO 23.5 high pressure pump with gauge. 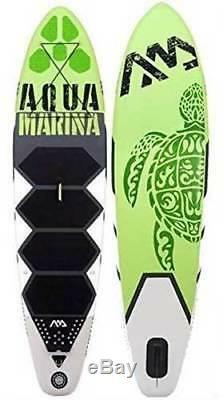 The item "Aqua Marina Thrive Paddle Board 9'9 Inflatable Stand Up Paddleboard with Paddle" is in sale since Thursday, April 12, 2018.